This is the existing layout- the bathroom is cramped and the closets are right off the hallway. Here is a shot of the model from the side of the house. There are existing huge fir trees that tower. Here is another view of the model of the addition. And here is what it would look like when entering the front of the house. 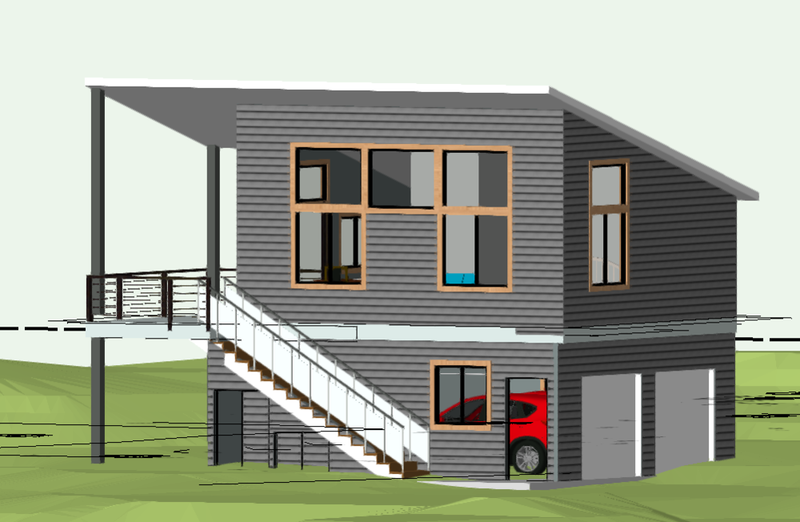 This design is for a sloping lot facing the water, so the decks step down with a sunken Living Room. Still working on the model here, as it is a “Progress” model to show the client the idea. 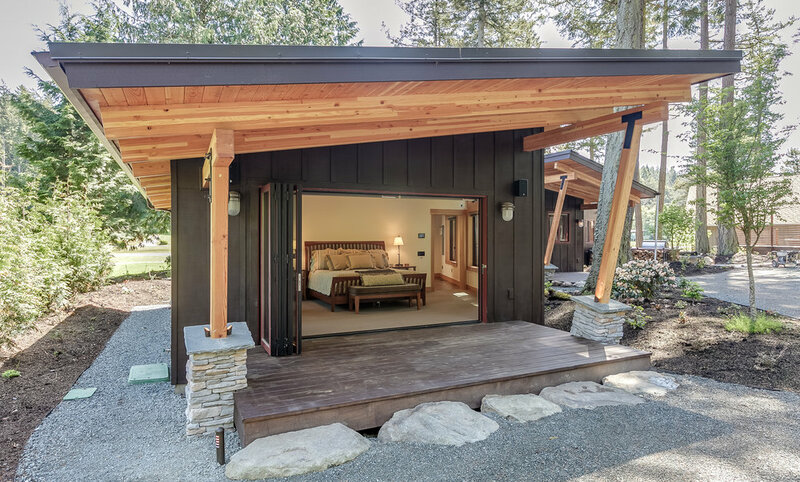 The existing cabin is to the left, and the client wants to save money by retaining the cabin and re-doing the entry, kitchen and dining room with an arbor over the entertaining deck. There is a large rock out-cropping that looks like a giant dome. The site has a downward slope from the upper road and is right on a lake front. 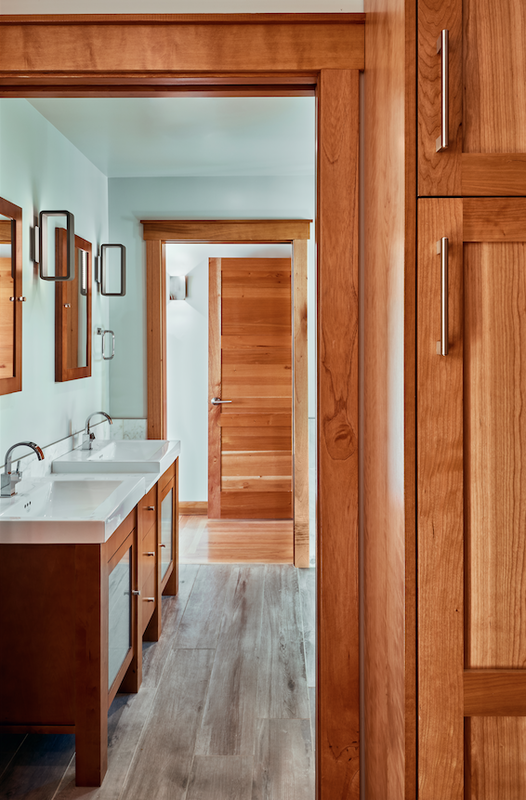 These are some model shots of a house that is just starting construction on Whidbey Island, WA. What better way to wake up then with an open view out to your garden? This Master Bedroom addition takes advantage of a secluded garden to open out to with accordion folding doors that open all the way back. 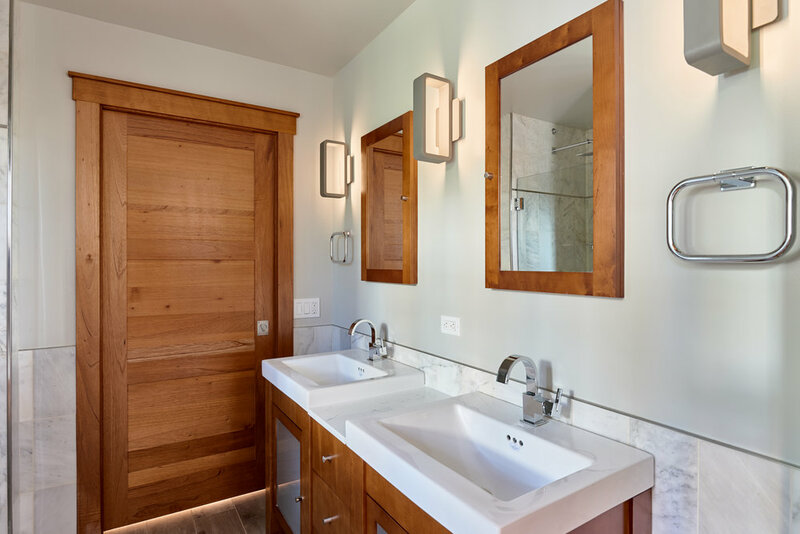 Having light wash down above the sinks and shower with skylights helps balance out the fact that this huge bathroom only has one window up high to maintain privacy. Even though the original fireplace was surrounded by old growth redwood, it had no mantel and the redwood was faded around each picture that had been there 50 years. We tried to salvage them & re-finish, but they splintered off. SO sadly, the redwood was removed and a new fireplace with bluestone facade was installed. 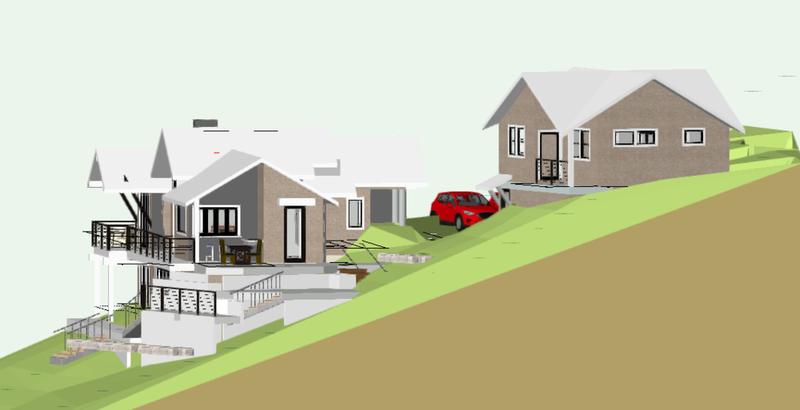 This is a working sketch (actually screen shots) for the client to get a better idea of what the structure looks like. 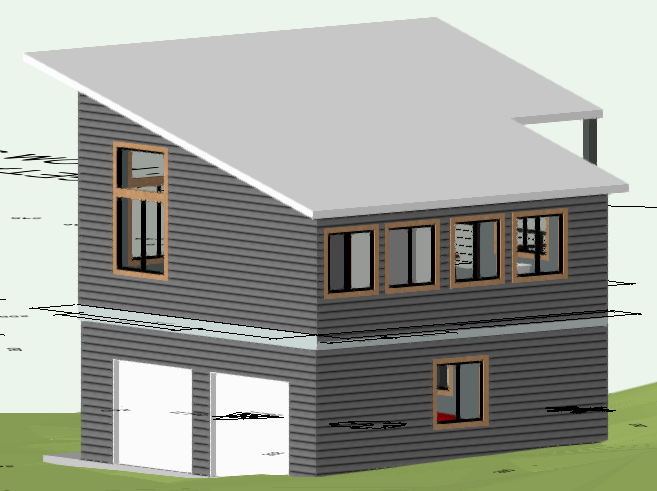 It is much easier to imagine the final project then just looking at 2D drawings of the exterior elevations. The Green carpeting had to go for sure,, but removing the solid guardrails (even thought they were in REDWOOD, opened up the space. The contractor tried to save the redwood on the old stair and walls, but it splinted when it was removed. The new stairway opens up the whole space. Even though the stairway before had original redwood paneling from 1954, it was tired looking. It was all enclosed and dark feeling. The stairway was totally re-built and the upper stair has open see-thru treads bolted onto a stell frame with stainless steel Guardrail by "AGS Stainless". Treads are Fir.